Enhance your business meeting with a state of the art conference room. 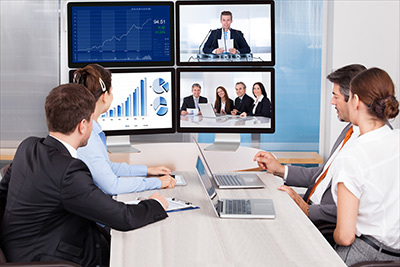 We are able to seamlessly integrate the various systems of an automated conference room, from projectors to lighting to video & audio conferencing and overall control of the entire integrated system. We also take into account the time sensitive nature of your project given your company’s daily operations and coordinate with other contractors to make a smooth process. Jim and his crew saved my entire implementation of my home audio/video/lighting paired with Savant's home automation platform. I had been through 2 integrators previously. My first integrator failed to address many of the issues on the setup they installed themselves. My 2nd integrator was decent, but never responded to my follow up inquiries. I contacted Savant Systems and asked for the best integrator in the area and they recommended INI. Jim has always been responsive and efficient by making sure all issues are addressed. Jim and his crew (I met Luke and Pablo) were able to address all of my issues and get my setup rock solid. I haven't had one single issue since. My biggest regret is not finding them from the beginning of my build out. I would have likely saved money and time if I used them from the beginning. I won't hesitate to reach out to INI for future needs or the next home system I build out. I had them automate my house and the professionalism and attention to detail was prefect. To sum it up, it just works. It was a three man team to automate my house with lutron lights, audio, and video control using a Savant system. They ran wire, redid my network, and showed my how to use the new simple technology. It's pretty cool to go from just hanging out to full entertainment inside and outside of the house for a game while playing music with two touches on my phone. The team was fast, efficient, and knowledgeable. You can tell they've been working together for awhile. I have used the INI team for a few jobs because they are professional, thorough and I trust them. Jim and his team are technically savvy and remain available and responsive when I call back with questions. They also care about their community and have supported numerous Veteran / Wounded Warrior events. I will use INI again. When our home was built, INI did all my audio/video installation. Any issue I had, they were right there with positive assistance. Jim and Eric are the best. They are knowledgeable and courteous. I trust them without any hesitation. We have worked with Jim and Luke and the folks at INI for over 10 years. They have always been exteamly helpful listening to what we wanted to accomplish with our TV and sound system helping us to realize our a fantastic finished product. Not being Tech savy we were more than intimidated by the incredible advancements in TV, programming and sound systems. Jim or Luke were always there to answer our questions and to walk us through a glitches we may have caused. Their incredible patience led us into the new world of modern TV viewing. I would highly recommend this company to anyone who is looking for the latest and greatest in home entertainment. They are just the BEST. INI did an awesome job hooking up my condo. From tv's, sonos sound system to a new network. Staff was friendly, punctual, flexible around my work schedule. Took extra time to walk me through how to use the system. Very professional and clean.